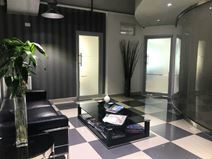 This office space is located in the heart of the Dominican Republic, in the Santo Domingo area. This office space puts the client first comes equipped to handle all of your business needs. This location was designed to enhance the comfort and operations of customers through highly professional environments. This office space offers access to many of the areas train stations, restaurants and activities. This professional business center is situated within a key local commercial hub for the region and is part of a significant and highly renowned, premium landmark office building; with numerous occupancy packages available on flexible terms for the ease of the client. A full range of state of the art facilities, technological equipment and amenities is available on site; including spacious meeting rooms, comfortable breakout space, an impressive reception area and copy and printing services as standard.